The sci.fmin and sci.fmax modules deal respectively with the numerical minimization and numerical maximization of functions of one or more variables. To simplify the exposition only the case of function minimization is discussed here. All algorithms are implemented symmetrically for both sci.fmin and sci.fmax modules. If stop is a positive quantity, the algorithm stops when the maximum range over each dimension of the population gets smaller than the specified quantity. Otherwise stop is a function which is invoked after each generation and returns true to signal the end of the optimization. Its arguments are: the current argmin, the current minimum, the violation (i.e. the evaluation of constraint(x, lt)) for the current minimum, the current population matrix (individuals as rows), the vector of evaluations of f(x) corresponding to the current population, vector of violations corresponding to the current population. The algorithm requires either xl and xu or x0. If x0 is present then the initial population is set equal to x0 and np is implicitly determined. Otherwise the hypercube defined by xl, xu is uniformly filled with np individuals. If np is not set then it's determined according to a rule of thumb based on the dimensionality of the problem. 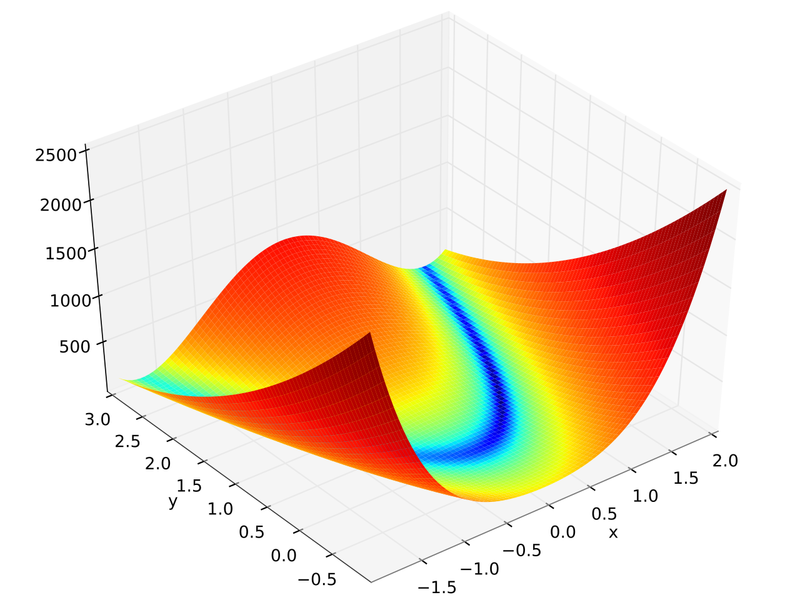 The function constraint(x, lt) allows to specify any kind of linear and non-linear constraint. Constraints must be expressed using lt(x, y) for x < y, summed together and returned from the function. The use of lt() results in constraint() returning a positive quantity whenever the constraint are not satisfied and 0 whenever they are. We refer to this quantity as violation. If constratin() is not specified, it is assumed to always return 0, i.e. the range of the function to be optimized is unbounded. The algorithm guarantees not to evaluate f(x) at any point there the violation is positive, i.e. where the constraints are not satisfied. It should be noted that in this variant of the Differential Evolution the population is allowed to move outside of the initial region if not constrained so by the use of constraint(). If rng is not set a new pseudo random generator is created via prng.std(). When the algorithm terminates it returns: the current argmin, the current minimum, the violation for the current minimum, the current population matrix (individuals as rows), the vector of evaluations of f corresponding to the current population, vector of violations corresponding to the current population. local alg  = require "sci.alg"
local fmin = require "sci.fmin"
local N = 6 -- Number of dimensions. local start = os.clock() -- For timing.